The International Construction Law Association, in collaboration with the King’s College Centre of Construction Law, the Alliance Steering Group and the Society of Construction Law, will be holding a conference on Thursday 1st March that will explore the links between procurement, digital technology and the law. Alliancing and BIM are topics that are at the very frontier of developments in international construction law, as a lack of communication, mutual trust and cooperation become increasingly recognised as serious impediments in complex construction projects. The ICLA Conference presents a unique opportunity to bring together leading experts from around the world to explore the future of collaboration and multilateralism in international construction law from a comparative perspective. Practitioners and academics from the UK, the USA, Brazil, Bulgaria, Germany and Italy will explain how improved value is achieved using alliances, BIM and collaborative contracts. 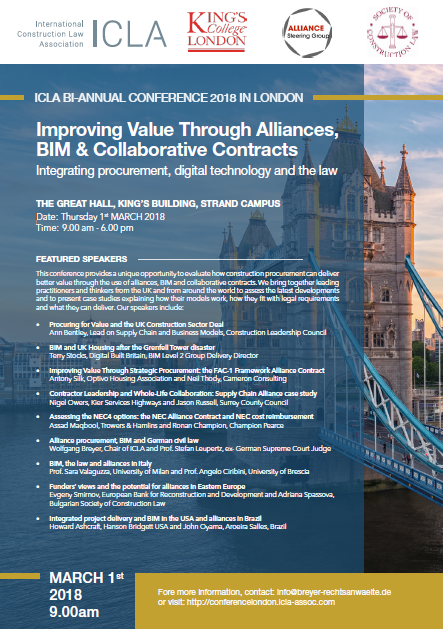 The conference will also examine the UK Government’s “Procure for Value “ initiative, the role of BIM in UK housing post-Grenfell, and the ways that new contract forms such as FAC-1 and NEC4 are working in practice. The conference will take place at The Great Hall, King's Building, Strand Campus in London, UK. Flyer and the registration form are downloadable in the bottom right corner.